Crusher is treating a lady who injured herself in the holodeck. Riker and Ro are arguing. 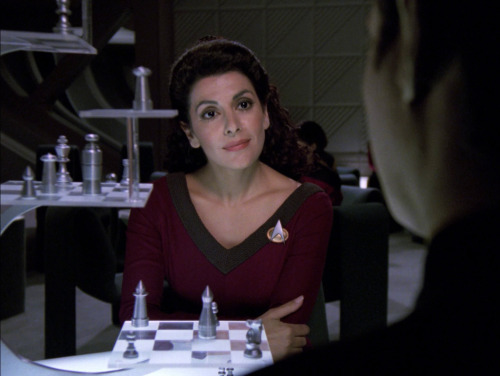 Troi and Data are playing chess, Troi wins so Data has to make her a fancy cocktail. 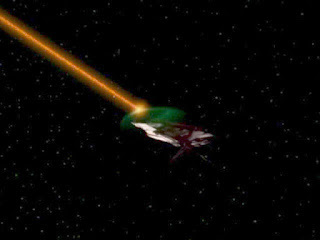 A small ship approaches and scans the Enterprise with green light, it's a weird scan, but Picard doesn't order the shields up in time. After the green light passes everyone has amnesia, even Data. Personnel files are found for all the characters I've mentioned by name so far, and that random redshirt dude from the Bridge, who is apparently an Executive Officer (suspicious). Everyone assumes their correct ranks, and Worf apologises for claiming a command he didn't earn, but Picard is cool about it. Further investigation reveals that the ship is called the Enterprise, their organisation is the United Federation of Planets, and they've been at war for 6 years with some guys I've never heard of, who've been making ships disappear with a new weapon (very suspicious). It turns out the Enterprise's mission was to go and destroy the enemy's central command in order to end the war. Meanwhile Troi tells Riker he's familiar again, and Ro sneaks into Riker's quarters so they can have sexytimes, which is fine as neither remembers they can't stand each other. There's an encounter with a small enemy ship and Random Redshirt Dude (seriously, who are you?) pushes Picard to destroy the weaker ship. He does, but isn't happy about it. Sensing Picard's reluctance, Random Redshirt Dude tries to argue him into following the written orders they found without confirming the situation externally. Troi tells Riker that the war feels wrong, and he says that's probably how war is supposed to feel. Crusher has found info that might help with a treatment, but she needs everyone's medical records before she can try it. Random Redshirt Dude is the one who is chosen to try her treatment, and he says it hasn't worked. Hmm, convenient that. Random Redshirt Dude talks to Worf privately and uses the word warrior a lot to convince Worf that Picard doesn't have the guts for combat. When the moment comes Worf should do what Random Redshirt Dude says and shoot stuff. He doesn't even go here! The ship approaches enemy territory, 3 tiny drones try to stop them and present no challenge, it'ssuspiciously easy to just rock right up to the command base. The command base has crappy defensive capabilities and no weapons. Redshirt Dude urges Picard to destroy them, it wouldn't be difficult. Picard refuses because he might not remember who he is, but he knows he doesn't kill the defenseless. Redshirt Dude tries to commandeer the ship and approaches Worf's console while ordering him to fire. Worf doesn't and tries to swipe him away, but Redshirt Dude chucks Worf aside. 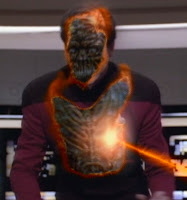 A human shouldn't be able to do that, so Worf and Riker fire phasers at him, revealing he's not human. Then a big cut to later, and Picard's log informs us that Crusher has been working to restore memories. This skips both the mopping up of Redshirt Dude and people remembering who they are, which feels like a missed opportunity. Imagine all the shocked-face acting we miss out on here. Turns out Redshirt Dude was from a race that were at war with those other guys, and this was the plan to destroy their enemy once and for all. In the penultimate scene Riker identifies the major flaw with this episode, if just one of those dudes could single-handedly remove people's memories, but not their useful skills, and alter all their computer files (and Data), why go to all this effort with the Enterprise? Picard responds that Redshirt Dude's people had lesser weapon's capabilities, and for some reason Riker has no follow-up questions, even though Picard in no way answered the question. Then Riker must face Troi and Ro. Even without his memories Picard's morals and leadership skills are still present. He argues with Random Redshirt Dude about aggression and not attacking those who can't defend themselves. Though it's Picard's initial desire to appear friendly by not raising their shields, that is what got them into this situation in the fist place. Riker still identifies Picard as his superior, even without their memories - he's basically just imprinted on him. As well as doing his duty in weird circumstances Riker still has time for fun. He happily goes along with what Ro initiates, but gives her plenty of opportunities to make her intentions clear and back out if she wants. He kind of bonds with Troi too, but it's clear the feelings are more on her side. 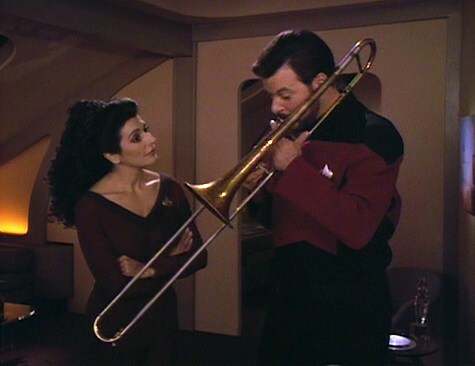 Amnesiac Riker is surprised to discover he plays trombone. It's clearly a weird hobby in the future. It makes sense for Worf to take command, his big, insignia'd sash is more impressive than Picard's tiny collar buttons. * Unsurprisingly he thinks of combat over people and is still guided by Picard a bit. She feels the strong bond with Riker from the start, but doesn't push things with him much. She finds evidence they were close and they almost kiss, but then Ro comes in. I bet Troi can sense what's happening between Riker and Ro, it's pretty obvious. No wonder she races out of there. She kinda senses stuff is wrong, but as ever not quite enough to be useful (I mean Guinan could see through a whole alternate timeline. Troi couldn't even sense Random Redshirt Dude was lying). At the end Troi continues to be a good ex to Riker, though she'll take the chance to make him uncomfortable. 1. Picard and Redshirt Dude report to Capt Worf. No point being Captain of the Enterprise unless you get to run a staff meeting. 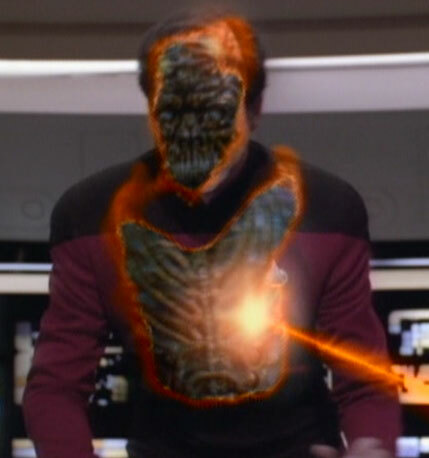 Worf's highest priority is combat readiness. 2. With ranks -but not memories- restored Geordi and Data explain about the long-running war, the enemies' brain disrupting weapon and their vital mission to destroy the enemy's central command. Troi suggests they get confirmation of what they should be doing, but Worf is against that. All the recovered files say they must maintain radio-silence, so Picard orders them to continue as seemingly instructed. 3. Worf and Random Redshirt are pleased about destroying a tiny ship. Ro makes tactical suggestions. Picard is uneasy and urges Crusher to restore memories, Data and Geordi are ordered to help her by finding everyone's medical files. Riker sees Ro and Troi in 10 Forward, he's proactive about speaking to them, no evasion, but clearly he's uncertain about where they stand. Ro and Troi are being friendly with each other (elements of ladies against hapless man, TV does this a lot, as though female bonding and info sharing is a threat somehow). They're kind of friendly to Riker, but with enough edge that he's not sure where he stands with either. The ladies refuse to be awkward about things, which is fair enough. No one here did anything wrong, but at the end Riker looks a little put upon, and I don't think he deserves to be punished. Is this supposed to be funny? It's pretty blah. * Is this why long-haired crew tend to wear their hair up all the time, so people can see their rank clearly on their collars?